Target 3 – Flexible Learning Environments – FWSU will maximize flexible learning environments by redefining the school day, promoting learning experiences that extend beyond the school classroom, and fostering creativity, innovation, and differentiated learning opportunities for all. Provide students with access to content, resources, and methods for learning beyond the school day and beyond the school walls. Develop opportunities for students to collaborate, innovate, create, and conceptualize in all learning settings. This year is the second year that Bellows Free Academy Fairfax has partnered with the Virtual High School Collaborative (VHS). Students can access a wide variety of courses that are not currently available at BFA. From Mandarin Chinese to International Business, from Screenwriting Fundamentals to Pre-Veterinary Medicine, unique subjects that defy traditional categories, AP® and Honors courses, elective and core courses – they are all available in the world of VHS. A teacher – specially trained in online education – posts lessons, guides discussions, provides feedback, aids understanding, asks and answers questions, and assesses the work submitted. Students are assigned a regular block period each day to complete VHS coursework and they can continue to study wherever and whenever they have access to a computer. Our students are are excited to be part of this world of global collaboration and enjoy rich opportunities to interact with other students beyond their own classroom. Hundreds of schools are VHS members. Using the latest web tools, students and their classmates debate, share, comment, and collaborate on projects. The VHS Collaborative is a non-profit organization that has literally changed the face of online and blended learning in high schools and middle schools across the country and around the world. Since 1996, courses that students thought they couldn’t receive, and administrators thought they couldn’t afford, have been delivered via the web by The VHS Collaborative. This has not replaced traditional classroom teaching but supplemented it with high quality education available to all, regardless of location, and within the most stringent budgets. What is VHS? It is global. It is authentic. It is the power of 21st century learning. It is a world of synchronous online courses, where students engage in challenging new subjects and teachers learn new skills. A world where technology enriches the classroom experience. Where schools share resources. And where possibilities are not limited by where you live or go to school. In the coming weeks, our schools will be hosting parents and guardians at annual School Open House events. This is an important opportunity for families to experience the learning environment that surrounds their children each day and to make connections with teachers and staff. The beginning of a new school year represents an important milestone for every child. Sharing the excitement and celebration of a new year helps reinforce high academic expectations. 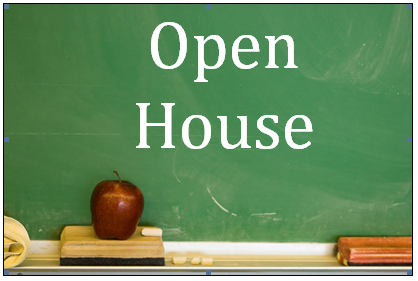 School Open House is a first step for parents and guardians to get involved in the education of their children. Fletcher Elementary School (PreK-6) – Thursday, September 27th: 5-6:30pm – Come for the Lasagna Dinner! Target 1 – Student-Centered Learning FWSU students will engage in personalized learning involving collaborative inquiry, problem solving and creative learning opportunities. Strategy – Highlight, create and model innovative learning opportunities that promote collaborative inquiry, problem solving and creativity for students and staff. GEMS 4th grade held its first weekly STEM Day, which offers a blended learning experience encompassing Science, Technology, Engineering, and Mathematics (STEM). These hands-on explorations offer students an opportunity to design and discover how science and math knowledge support real-world problem solving. 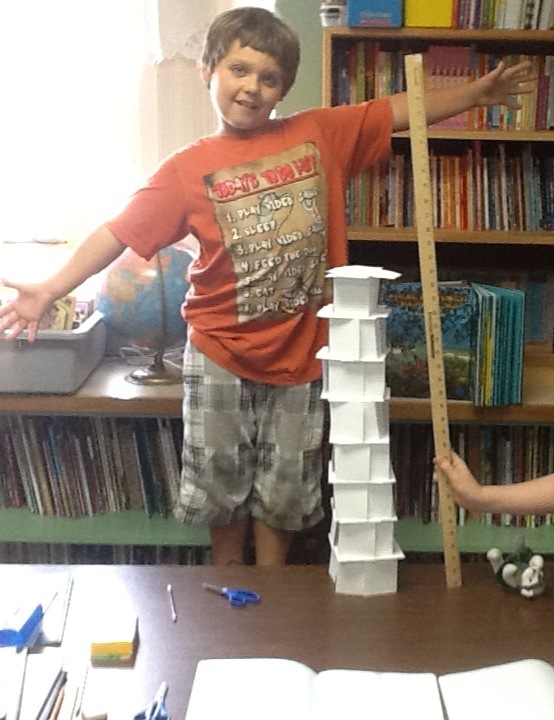 Using the Engineering Design Process, our students collaborated to successfully solve a problem. 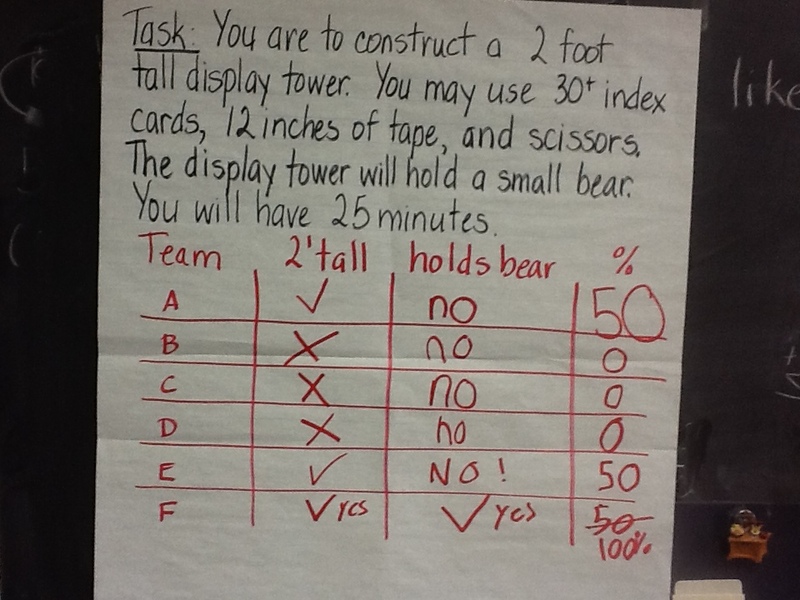 Each group was given a task to construct an apparatus that would hold a small stuffed bear for display purposes, using index cards and tape. 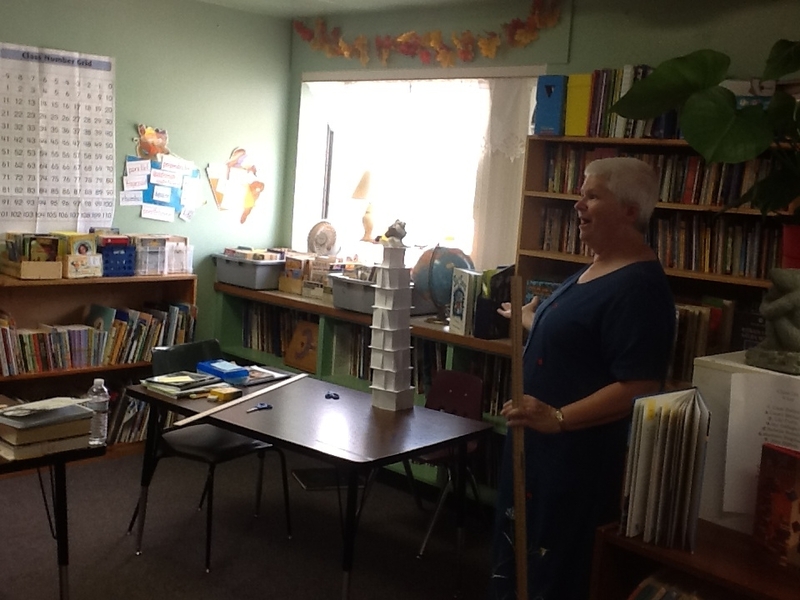 The supporting structure had to be at least two feet tall. Students were limited on the materials and tools allowed for the challenge – only 12 inches of tape, 40 index cards, and scissors could be used. Through planning and implementation, testing and redesign, our students learned how to successfully work together and use their science and math knowledge to guide their problem-solving. Elementary students who are engaged in a natural design process during STEM activities are likely to develop positive associations with engineering and increase their desire to pursue such activities in the future. As a part of FWSU’s opening inservice events, paraprofessionals were provided with a half day learning opportunity entitled: “Behavior and Communication.” This presentation was provided in conjunction with our community partner: Northwestern Counseling and Support Services (NCSS) The topic encouraged staff to engage with the presenter to gain additional understanding about behavior as a form of communication. Our staff is committed to developing learning habits that will foster growth and independence, while providing our students with a way to express their needs in the learning environment. Attention – To gain access to one’s attention, whether the attention is positive or negative. Escape/Avoidance – To escape/avoid a particular activity, situation, person. Sensory – To gain access to sensory stimulation. This will be the first of many learning opportunities as we begin our education journey for this school year! Elementary classrooms in FWSU start the day with Morning Meeting. This daily routine from Responsive Classroom (RC) is an opportunity where students explore and practice social skills and model how social, emotional, and intellectual learning come together in school. Morning Meeting is designed to give every child a sense of belonging and helps a child develop listening, expressive and cooperative skills. Most of all, Morning Meeting is designed to be FUN – a great way to start the school day! Teachers in FWSU generally participate in Responsive Classroom training during their first or second year in the district as part of their mentoring program. Responsive Classroom is a research-based approach to teaching children social skills and establishing a culture of caring within a classroom and a school. Morning Meeting typically has four components: Greeting, Sharing, Group Activity, and News and Announcements. Our goal is to help create a positive sense of community in the classroom. We recognize the need to systematically teach the skills of friendliness, listening, participation and including others. The meeting also serves to model dialogue among even the youngest children. Laughter and silly songs often accompany Morning Meeting even in classrooms with older students. This gathering time each morning gives students a chance to model and practice social skills with the help of entertaining greetings and songs that become familiar rituals within the groups. Some days morning meetings feel like a gathering of kids around a campfire at summer camp – a time when you hold your breath and wish for the magic to never end. 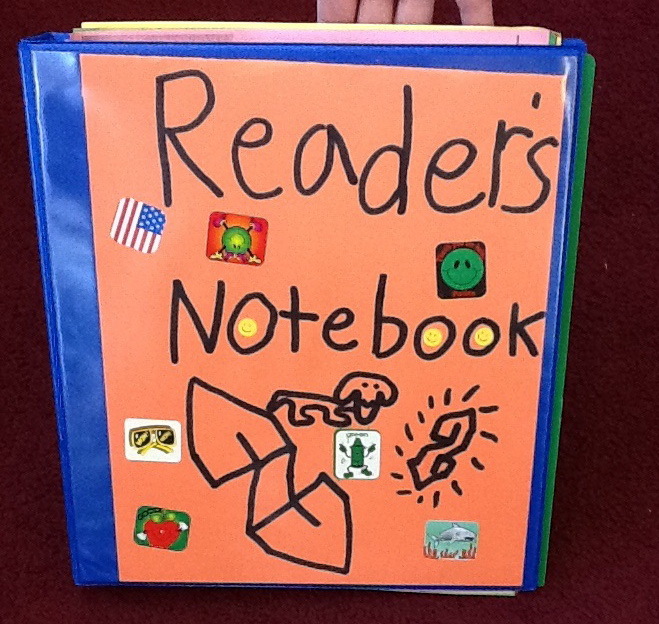 Readers Workshop is a research-proven method of reading instruction that uses direct instruction and practice to promote a love of reading in students. It also personalizes the learning experience of each student and allows for differentiation to occur naturally. Students read books that are “just right” for who they are as learners. Fletcher Elementary School this year just launched a new school-wide Readers’ Workshop during its literacy instructional block. This model allows students to gain the benefits of reading through self-reflection, self-pacing and time spent reading and sharing books. 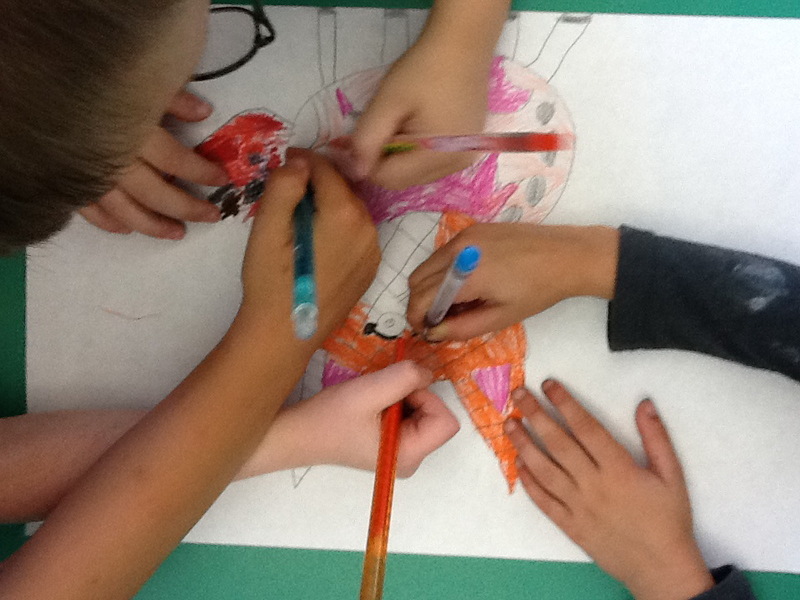 The Readers’ Workshop model also promotes a learning community that fosters diversity and the development of each student’s self-confidence and self esteem. 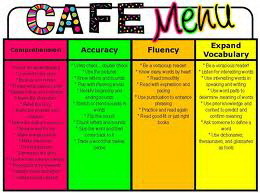 Cafe’ Menu provides students with strategies to support their reading. 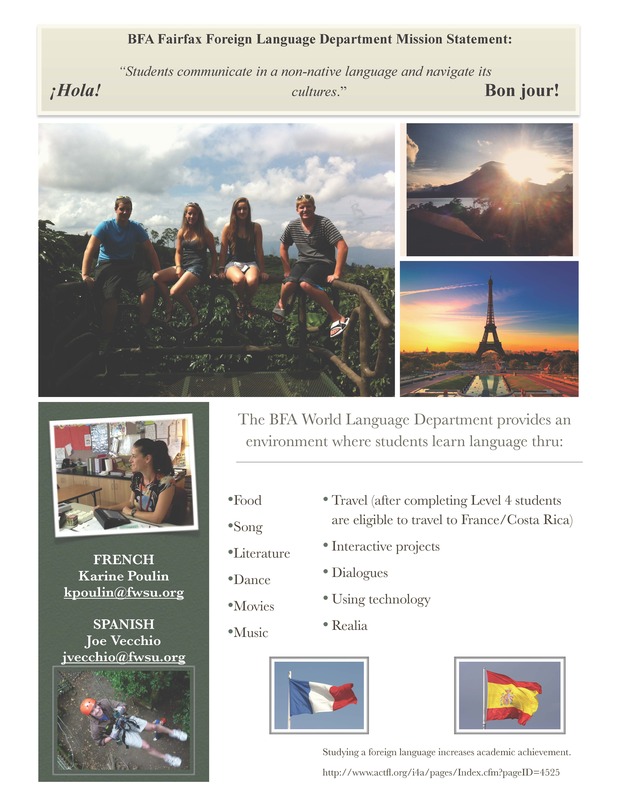 At FWSU we are fortunate to be able to offer world languages to many of our students. Learning a new language is not always easy, but it is worth the challenge! 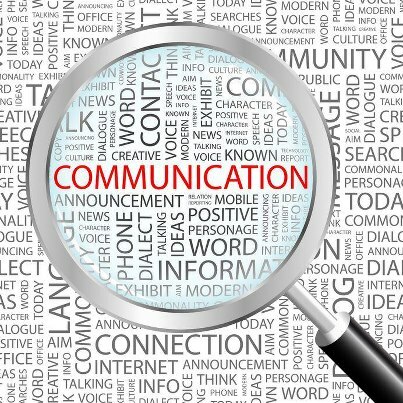 Gaining world-language communication skills can be the key to unlocking new opportunities in a rapidly-changing global marketplace. Schools recognize that foreign language instruction is vital to preparing our students for success in a future that has yet to be defined. But perhaps the best reasons are to challenge yourself and to have some fun too! Students at BFA have choices between French and Spanish once they reach high school with Madame Poulin and Senor Vecchio. At GEMS, Spanish begins in Grade 7 with Ms. Peterson. 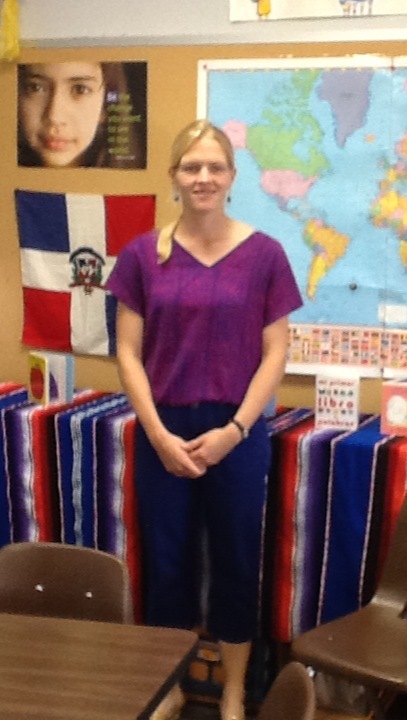 Ms. Peterson is new to GEMS and we are glad to have her join our team of language experts! Adventures in World Language from bfaspanish on Vimeo.